The following specials are until Tuesday April 30th 2019 and are while supplies last. SCROLL TO THE BOTTOM OF THE PAGE FOR EVEN MORE SPECIALS! A popular harbinger of spring (we have robins here too) these flowers stand out in every garden. 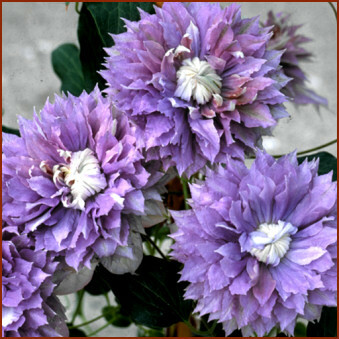 Choose from a great selection of very special plants personally selected by the Grobe Team. 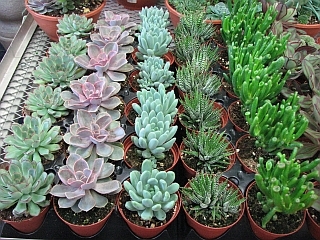 a tremendous selection of never before seen succulents too! 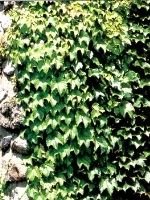 Popular plant (also known as 'Monstera') with unique split leaves. Our plants are just starting to develop this 'split leaf' form. 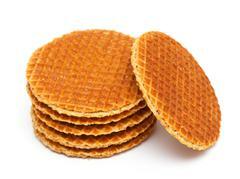 A Dutch treat (made right here in Ontario), these syrup filled cookies are very popular with young and old. One of the best cookies with coffee... simply place over your mug and the steam will warm it. Delicious! These loose leaf teas are guaranteed to please. It doesn't take much to make a great cup. 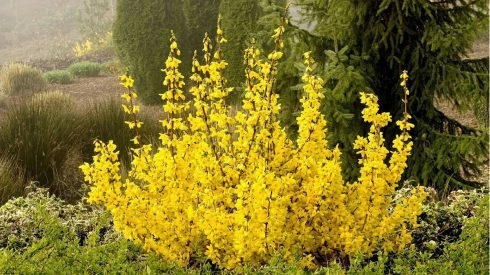 PLANT THIS SPRING TO ENJOY ALL SUMMER! 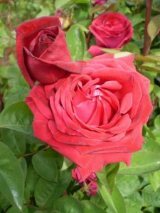 Easy Elegance roses are super hardy, do not suffer the ravages of black spot and mildew, and are incredibly easy to grow. Get them now before they are gone! Pot shown is not included. 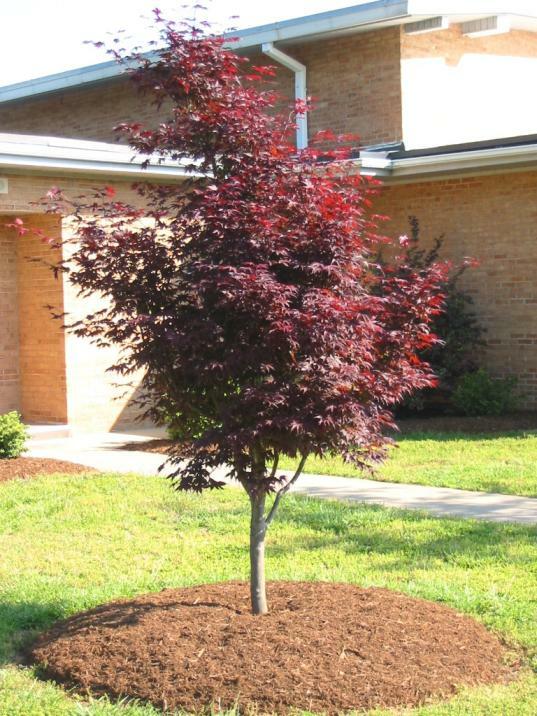 WHY CHOOSE GROBE'S FOR TREES? 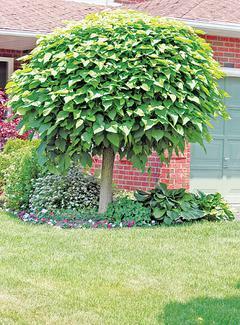 Because Not All Trees Are Created Equal! 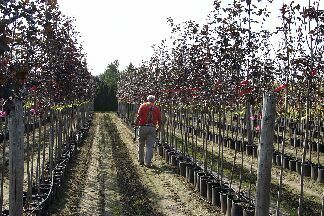 We travel the province and personally select every tree to ensure our customers the very best quality available! 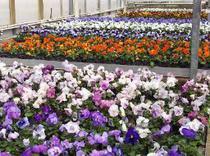 We offer the largest selection of varieties in the Region, including the unusual or hard to find. 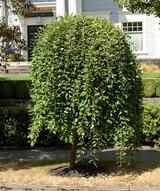 Our container grown trees will not suffer transplant shock no matter when you plant them. MORE SELECTION THAN ANYWHERE ELSE! 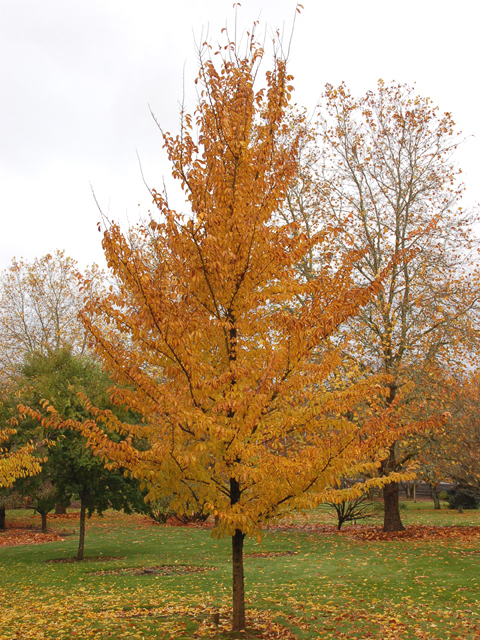 Click here to see our Tree Gallery. Late budding smaller tree with large leaves, no pods that grows in an round form. 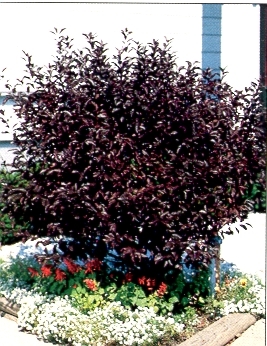 WHAT HAVE YOU DONE FOR YOUR TREES LATELY? 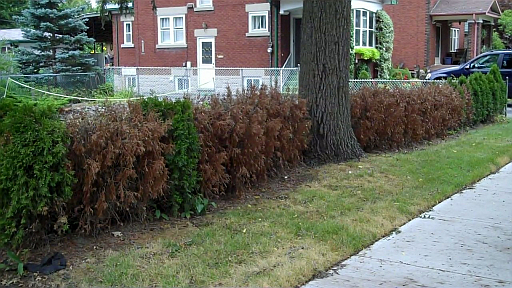 Trees over the last couple of years have had to contend with lots of stress from heat, drought, ice and wind. These stresses may take many months to manifest on a tree. Additionally, the loss of ash trees has only increased our awareness of how important these silent giants are to our health and our environment. 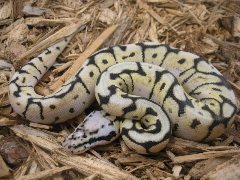 But we think far more ill of someone who puts a living pet out in the yard in the sun without food or water, then one who does the same with their living trees! Grobe's wants to help you to do your part. 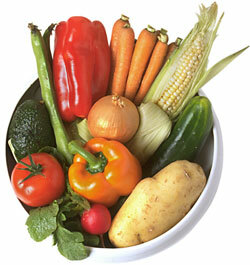 The following items will help you to feed and water your plants. This handy gadget connects to your house to permit you to deliver food or water directly to the tree or plant root zone. As it goes below the turf, it gets where it is needed. 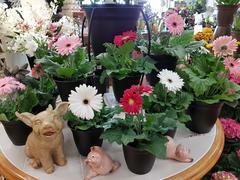 Fertilizer cartridges are available separately - but it shines when watering! 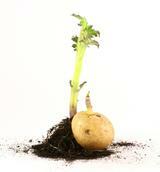 Slow release 14-7-14 fertilizer will feed most of your garden plants easily. Yes we do! 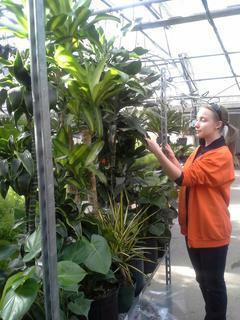 We plant throughout Waterloo Region, Guelph and environs. 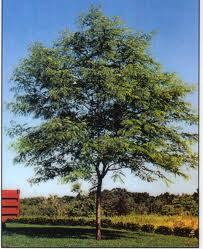 Visit today and see how little work planting a tree can be! 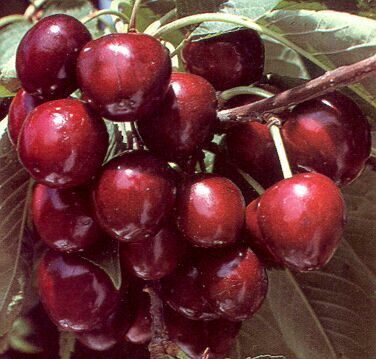 Choose from one of the largest collection of small fruit in Ontario. 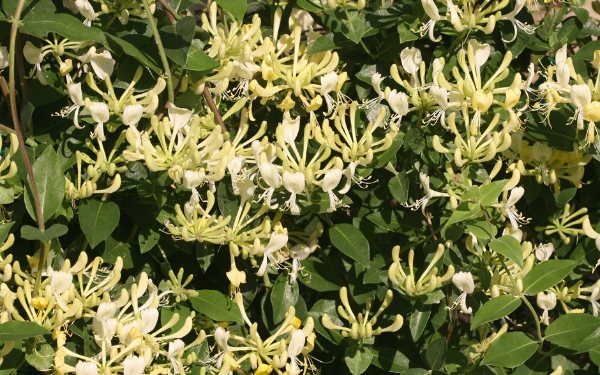 Haskaps are members of the honeysuckle family that offer edible berries much like a blueberry. They are also known as honeyberries. They grow very easily in our climate to about 4'+ tall and wide. Their 'claim to fame' is their great hardiness, adaptability, and the fact that the berries provide 5 times the anti-oxidants of blueberries. 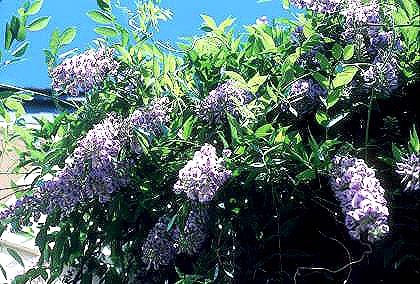 At Grobe's we offer for 2017 four varieties. Two are the very best from the University of Saskatchewan breeding program, and two are the very best pollinators available for them. They bear 'loads' of berries, usually starting within a year or two. 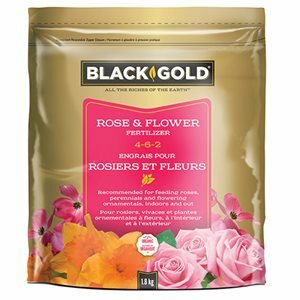 Everything needed to start your own plants at home. 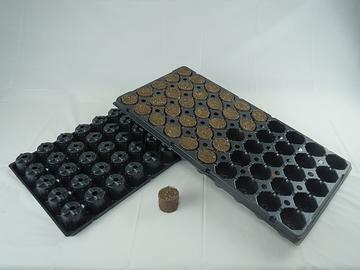 Larger deeper 50 plant flat can hold fast growing plants longer. Easier to transplant from cube to larger pots too. Special sterile mix is composed of 60% peat, 30% fine perlite, 10% coir, a starter charge, a wetting agent and WP RootShield. 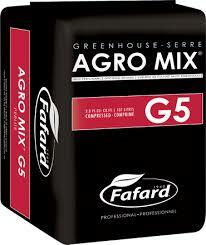 This mix is specially created to assist you in germinating even the most difficult of seeds. SHHH! Don't Tell Anyone..It's Perry's Secret! 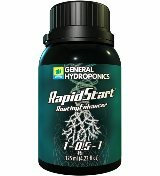 Usually available to hydroponic growers, this little bottle will make roots grow like CRAZY! 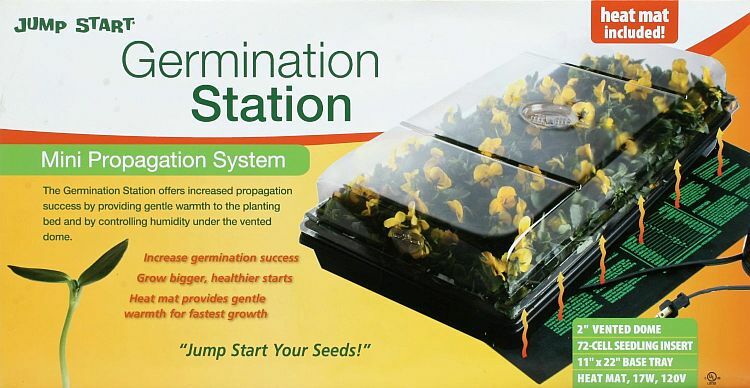 Super concentrated, only a little will give you the rootiest seedlings ever. Azomite is found in only one place, in Utah, where it was formed millions of years ago in the interaction of volcano/sea bed formed rock that was rich in mineral composition. 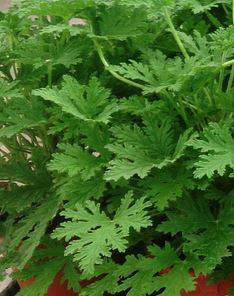 This pulverized rock, when added to your beds, pots or vegetable gardens, acts like a 'super-vitamin', by correcting a vast array of large and small mineral deficiencies. 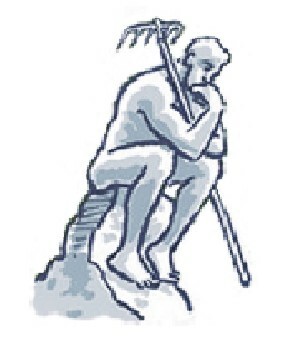 Plants have been shown to grow only as well as that which limits them, and when these minor deficiencies are resolved - plants that grow better, are happier, and have improved flavour and disease resistance, is the result. Tested by skeptics at Grobe' too - we are believers! Earth Alive’s business is to harness the power of microorganisms to create products that improve agricultural productivity, reverse land degradation, increase resource efficiency, reduce pollution, and ensure the health and well-being of a rapidly growing human population. 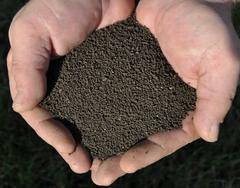 This bio-fertilizer adds beneficial microorganisms to tired or poor soils. 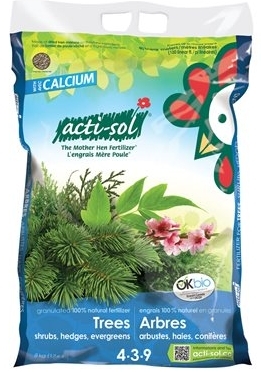 Improves utilization of any minerals or fertilzers - plants will thrive! FEEDING THE BIRDS IS EASY! This design is easiest to fill, and certainly one of the easiest to clean. 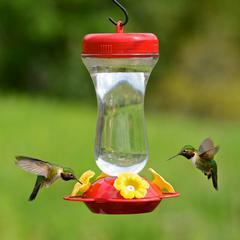 A proven performer that the hummingbirds truly enjoy. Cracked Corn and more for the broadest appeal to winter birds. A $3.00 refundable deposit is collected for the re-sealable pail. 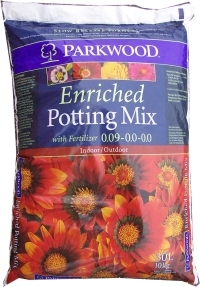 Only Parkwood Pails qualify for the refill price. Keep their sloshes and messes off your floors! Indoor - outdoor - rubber backed. Several sizes, styles and colours. Also neutralizes sidewalk salt damage. 5 kg pail treats over 100 sq. feet. Dirt Is What's Under Your Fingernails.. This Is Soil! WHY PAY EXTRA FOR A BAG? 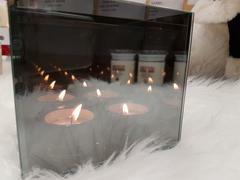 We can deliver to your home any size quantity you need. The More You Need - The Better The Deal! 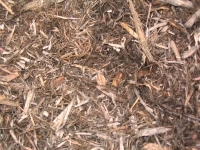 Soil mixes are loose soil dumped. 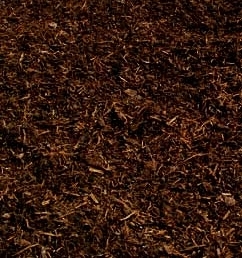 Screened Topsoil (for general use). Delivered - All Taxes Extra. Order over the phone at 519-648-2247 or in person at our store. Major credit cards accepted. No C.O.D. Payment in full prior to delivery. * A cubic yard is equivalent to approx. 5 to 6 large contractor wheelbarrows full of material. Sometimes.. it really is better to work with smaller bags. 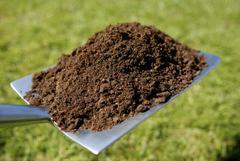 When you need clean weed free soil - due to the high temperature used in composting - they are! How many bags make a cubic yard? 30L = approx. 1.06 cu. ft.
A top seller! 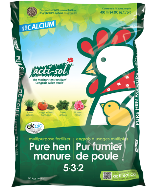 Rich in calcium - this 5-3-2 fertilizer is safe for all plants. Repels squirrels. 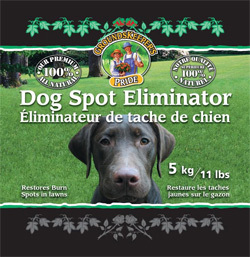 Helps to prevent tomato blossom end-rot. 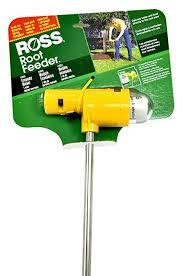 Can be used on the lawn as well for simple organic feeding. No 'poo' scent (it's more like 'bone meal'). 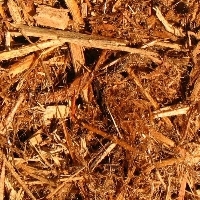 A golden honey coloured mulch that retains its light colour - does not turn black! 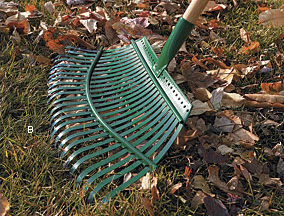 Long lasting - will look good for more than one season. 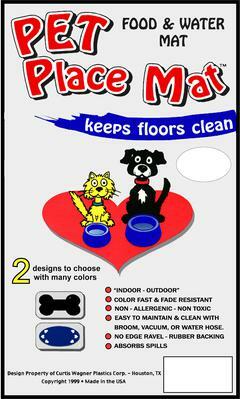 Easy to spread, mats well to retain moisture. Doesn't require as much depth of material. 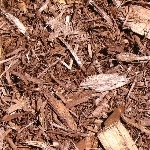 Not all cedar mulches are the same - this one is top quality all natural ground cedar - not a blend. 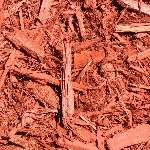 An inexpensive mulch that looks good and retains moisture. 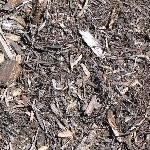 Many cedar mulches on the market are not 100% cedar. So what EXACTLY is the rest? ASK BEFORE YOU ARE FOOLED! YOU ASKED FOR IT... WE HAVE IT! NOT ALL EDGINGS ARE THE SAME! The most durable solution available - all aluminum. Easy connection, deep spikes - and firm enough to tap back down when frost moves it. Why Are Folks Buying Grobe's Lawn Program Already? It's a complete year long fertilizer program for anyone to achieve professional results by doing it themselves. It is designed for a 3000 sq. ft. lawn area and includes 6 applications of lawn fertilizer throughout the year. Unlike similar 'package' programs, it uses the latest granular slow-release fertilizer technology to deliver a complete and balanced feeding including micronutrients and phosphorus to ensure strong growth. The primary nitrogen source is UMAXX stabilized nitrogen, which is eco-friendly as it the only fertilizer available to homeowners to include two enzyme inhibitors that limit nitrogen loss due to volatilization to the atmosphere as well as due to leaching to the groundwater. This exclusive slow-release 28-4-12 fertilizer with 1% iron and micronutrients feeds equally well regardless of weather or soil temperature, will deepen turf colour, and is entirely used up by the turf. It can be used in fall to dormant feed, and what isn't used by your turf will be retained in the soil over the winter for later use in early spring. The summer fertilizer component of this program is a bio-based organic slow release golf-course fertilizer that can be applied at any temperature. Exclusively available in this program, it is safe for pets and kids, has an 70% organic matter content that will improve drought tolerance and stimulate microbial action and 2% iron for great turf colour. It will aid in minimizing 6 different turf diseases with over 6 billion beneficial bacteria in every bag, naturally reduce the amount of thatch, and will give controlled growth without additional summer mowing work for you. 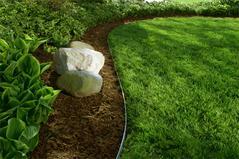 DO YOU WANT TO IMPROVE YOUR LAWN'S ABILITY TO WITHSTAND DROUGHT? A 1% increase in soil organic matter can improve your lawn's ability to withstand drought by as much as 50%. You can topdress with soil, or wait until your aeration cores have degraded to do this... but WE HAVE AN EASIER WAY! 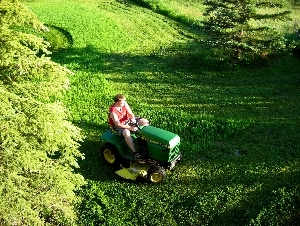 Do you have to feed larger than average sized lawns? Do you want to fertilize, but are tired of having to purchase poor quality fertilizers that grow the lawn quickly but fade just as fast? Grobe's is now a Nutrite Pro-Turf Fertilizer Depot, with a whole range of slow releasing, balanced products in larger bag sizes. Quality products blended for professional results. Nitrogen available from 5 sources of nitrogen that feeds continuously over 10 to 12 weeks. 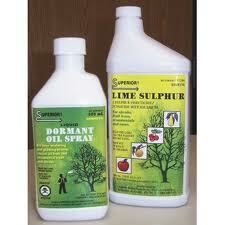 Enriched with sulphur and magnesium for excellent turf colour. Spec sheet on proper use and rates can be found here. 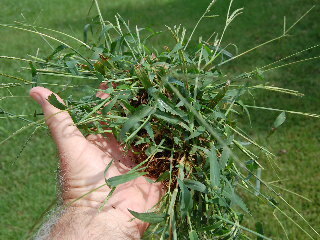 Crabgrass is an opportunistic annual weed that spreads by fall dispersed seeds. 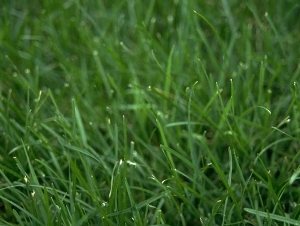 These germinate in early spring... and then there is no easy way to remove it from your lawn. However...an application of a natural corn gluten based fertilizer RIGHT NOW will help to prevent crabgrass and other weed seeds from germinating. Need Help Starting New Grass? 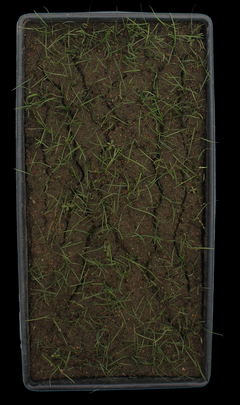 An exclusive blend of durable fast germinating grass seeds for infilling and thickening existing turf areas. 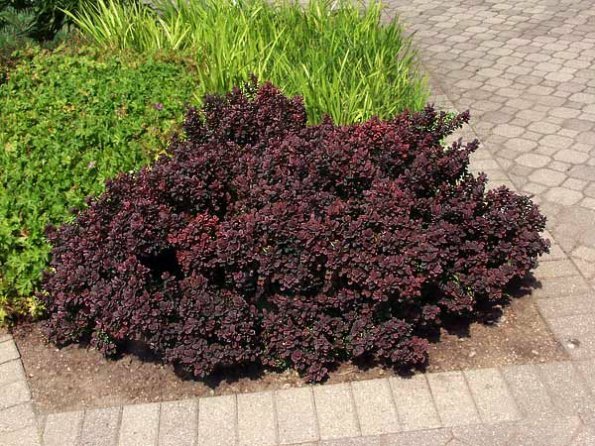 Consists of Turf-type perennial ryegrass and durable fescues. 1 kg bag overseeds 1300 sq. ft.
Not sure how to overseed? Watch our video here. 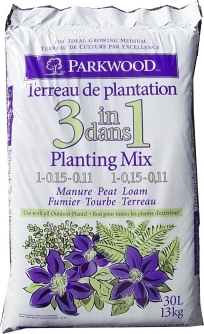 As seen in the video (above) this 'soil for seeding' is a proprietary blend of fibrous peat, compost, wetting agent, and simple nutrient charge. 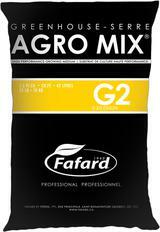 THIS is the best product for establishing grass seed. 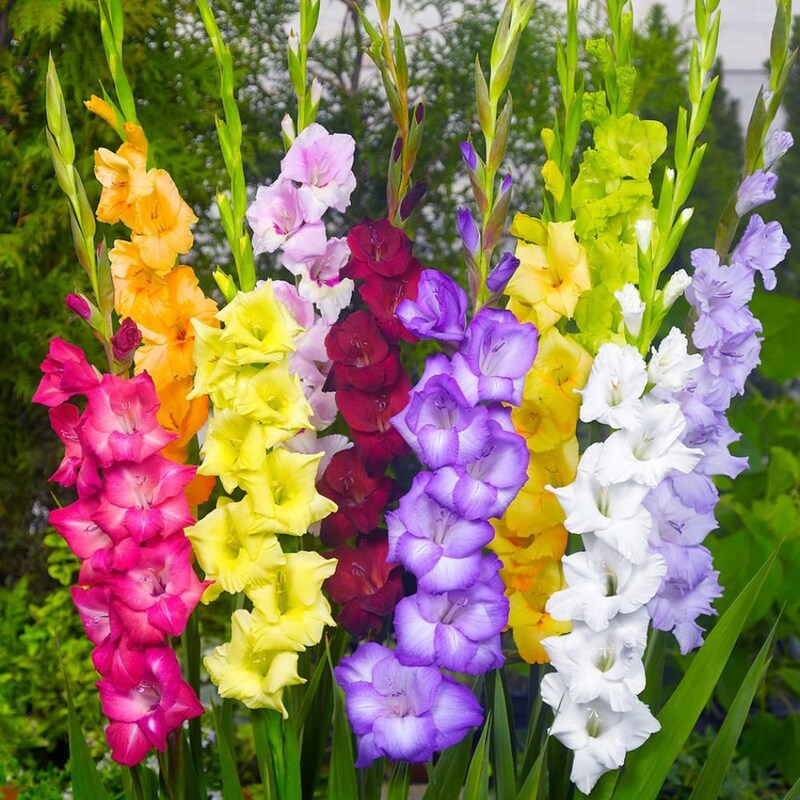 Below is what you typically get when you seed using a typical 'big bag' of soil or topsoil. Yes - the grass germinates... but the surface cracks and doesn't re-wet well. And of course you think YOU did it wrong, or that the seed is bad! 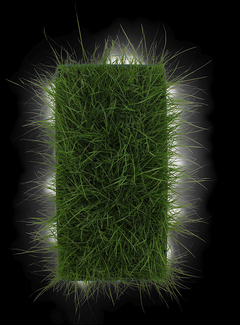 Grass is 2x thicker and healthier looking. 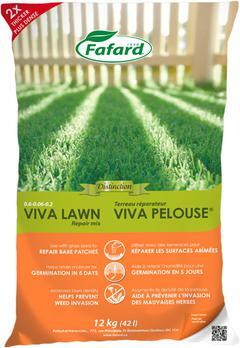 Did we mention that Viva Lawn Repair Mix is also 'free of weeds'? That 'big bag of soil' guy can't say that! 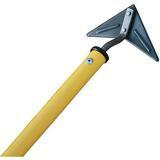 42 L bag used for overseeding will cover 100-140 sq ft.
Large tines get the job done gently. 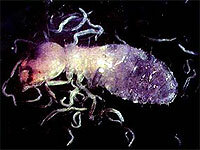 Need Help Controlling Lawn Grubs? 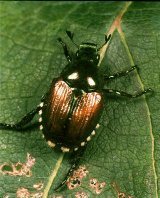 Lawn grubs are the larval stages of June Beetle or Japanese Beetle, and while they enjoy turfgrass roots they can feed on other plant roots too. Nematodes are microscopic roundworms that when applied properly to the lawn (soil temperature over 10 degrees Celsius, overcast conditions, watered in well) will seek out and infest damaging lawn grubs. Live organisms, they are safe around kids, pets and even earthworms and are at present the only available control for a grub pest in Ontario. They can be stored in your refrigerator for up to 60 days to permit you to get this job done when convenient. While best controlled in late summer or early fall, a spring application will help to reduce grub populations as well. Remember this pest and his many friends? NEMATODES HELP TO CONTROL HIM TOO! 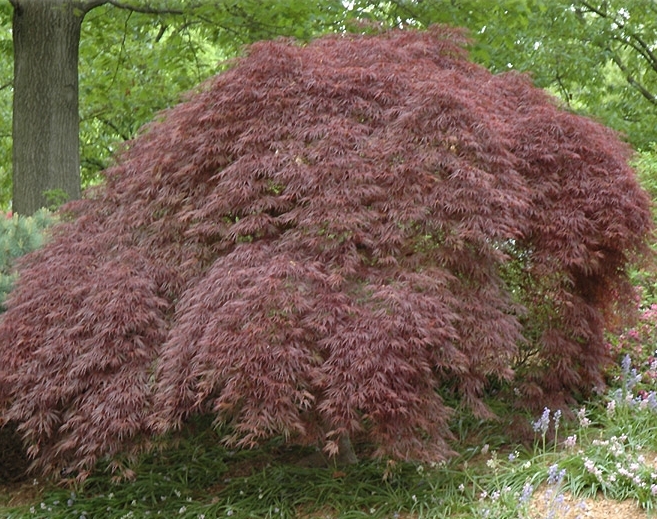 There are basically 3 ways to grow a cedar. One way is to dig it bare root in the field in a ball in spring. The larger the cedar, the more important it is that it has a large root system to support itself, so it's not uncommon to find a large root ball with this type of cedar. 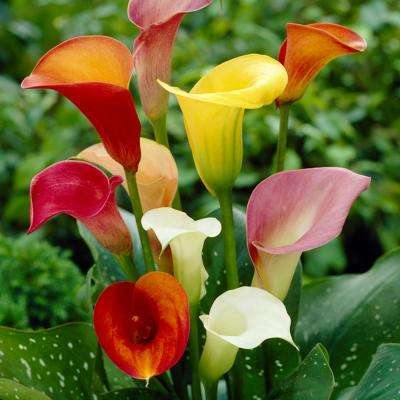 To ensure they can be planted all season long, they are sometimes placed into pots to keep them upright, and to make them easier to handle. 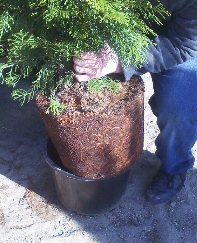 Another way is to start it as a small cedar in a pot, and grow it from very young in progressively larger pots until it is a bigger plant with a dense complete root system. 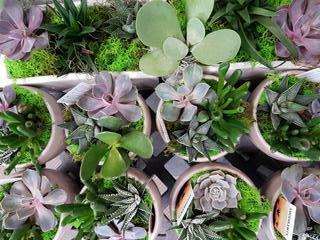 This 'container growing' means you have NO TRANSPLANT SHOCK, and with deep regular watering and feeding the first season it will grow and thrive. 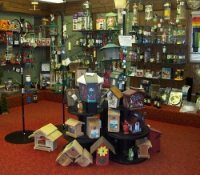 At Grobe's... these are the only 2 ways we sell cedar. 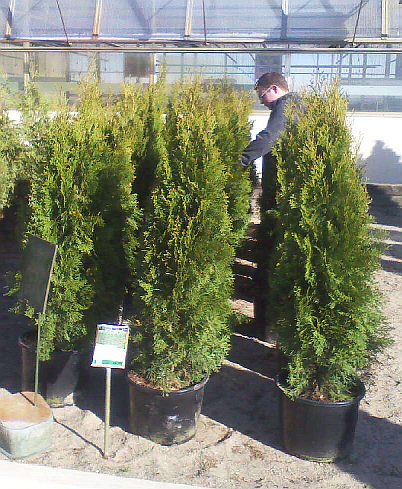 The third way is to clear a field of old, field grown cedars and place THEM into plastic pots. 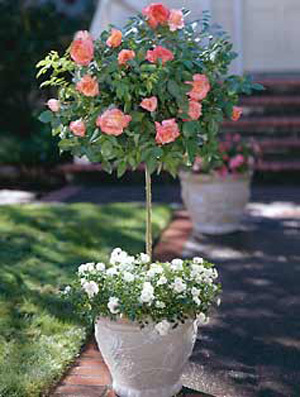 As heavy root balls cost a lot to freight, the smaller this pot is, the cheaper it is for the seller. So, fewer roots go with the plant. 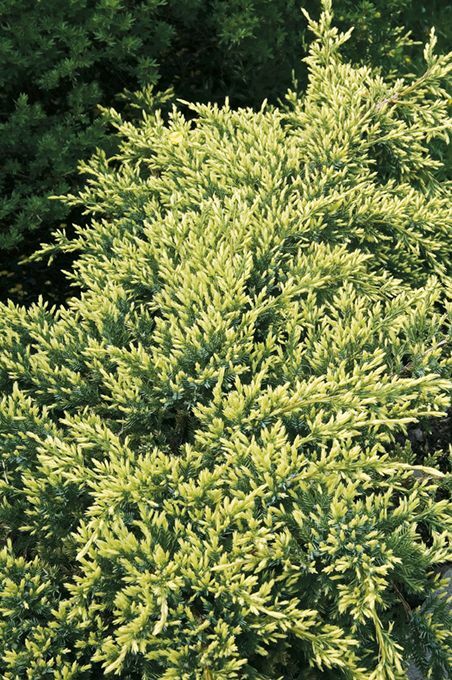 Makes it easy to plant, and cheap to buy... but it is much harder on the cedar. 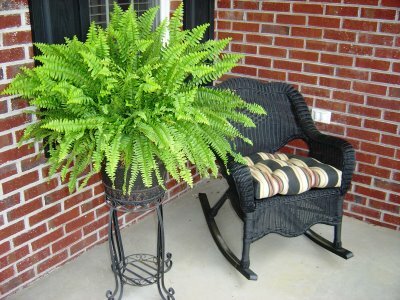 In fact, someone unsuspecting might believe it is a container grown plant. It isn't. So...does Grobe's offer an inexpensive quality cedar? We do - and they are now available this spring. But not for long, because they soon will be gone. Here's a picture of ours including the roots. We invite you to compare. At this price they are sold AS IS. 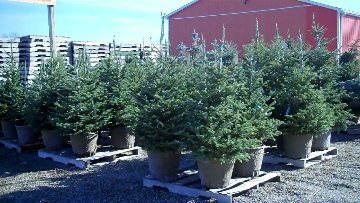 Pines, Blue Spruce and Cypresses are excluded. All your favourites - and new ones too! 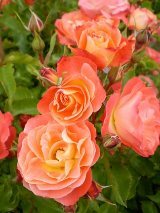 Blooms reliably at a young age. 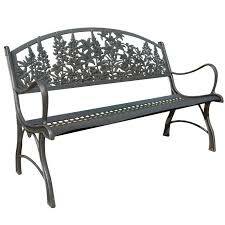 This ornate and beautiful bench is sturdily made and extremely comfortable to sit in to view your garden handi-work. Comes boxed - 4 bolts and you are done! Quality powder coat finished cast iron. Affordably priced humourous signs for every occasion. Many different signs from which to choose. Not sure you know what they would like? Grobe's Gift Certificates Are Great! No date of expiry or hidden service fees. Use it all at once, or a little at a time. And best of all... it can be used for so many things! 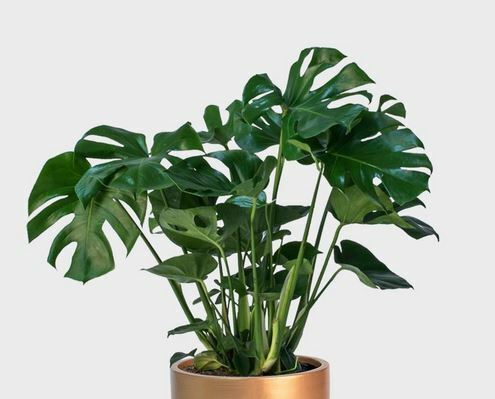 The perfect plant, a professional landscape design, a time saving tool, a unique piece of garden decor, or that special addition to a Christmas family tradition.. it will be The Perfect Gift for your recipient. Jewellery with an organic flair. .... and Looking Great Too! Our collection of well made and beautiful Galleria umbrellas are sure to be a hit. Best of all - you likely won't have to worry that they will end up in 'someone's' golf cart! 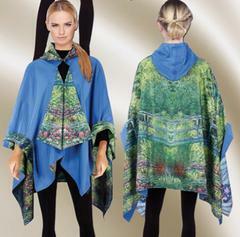 Galleria's RainCape line is uniquely designed with famous artists’ images on one side and a coordinating color on the other. The Galleria RainCape comes with either a matching famous artists print or solid color pouch. Our RainCapes are reversible, water repellent and lightweight with a luxurious soft feeling. Invisible magnets strategically placed to keep your RainCape intact on a windy day. In addition, Galleria offers the most up to date two-tone colorways for those who prefer solid colors. Whether you are expecting some rain, or just want a sophisticated look, our RainCapes can be used for any occasion. Several styles. 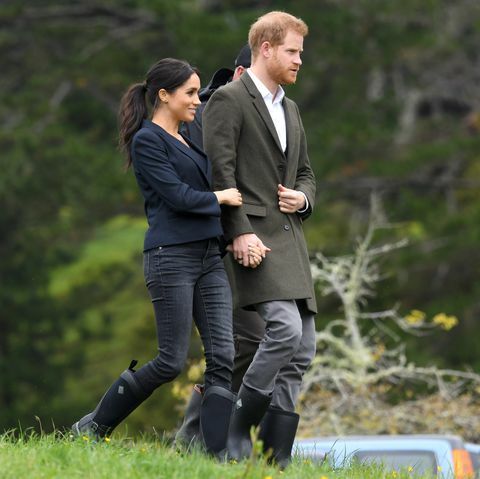 Guess who else enjoys the comfort of Muck Boots? They treat your feet like Royalty! April showers don't need to stop you from getting out in style! 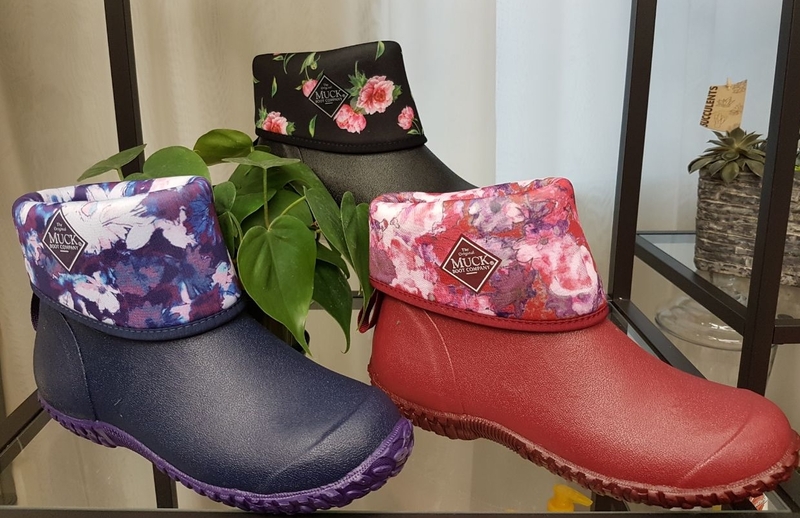 Grobe's has NEW Muck Boots Muckster II mid boots in stock that offer all day comfort with neoprene liners and high traction rubber outsoles to keep the water out. Roll them down and they become a shoe! 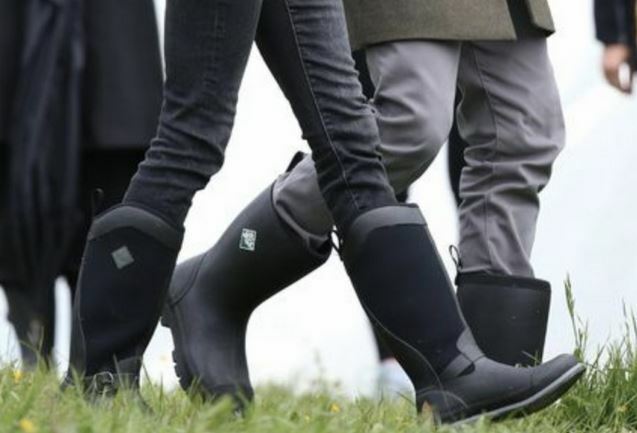 They will keep your feet warm and dry on those cool, wet mornings. Whether you're in the garden, running errands, or walking the dog, you're sure to enjoy these. Stop in soon and try on a pair! MUCK BOOT SPECIAL ORDERS NOW AVAILABLE! See their entire line here. See one of the largest collections of these beautiful hats in the Region. For everyone in the family (including the little ones). Stylish and quality compression socks from the leading name - and we have them! Introducing a sock that does amazing things for your body and looks great too. Dr. Segal’s Energy Socks improve your energy, reduce unnecessary pain and swelling, and decrease the risk of varicose veins and blood clots by increasing blood circulation. Put a little spring in your step - and feel great. Kindle the mood with these simple yet beautiful holders. A few candles can become many very quickly. The easiest way to make instant candles. 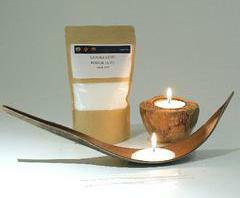 Simply place wick in container of your choice and place candle sand around it. 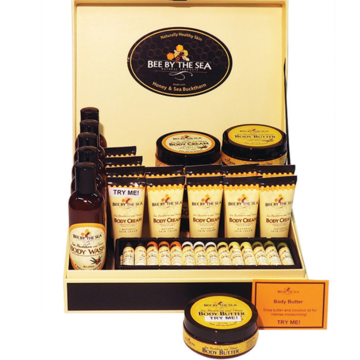 This natural skincare line is specifically formulated with Sea Buckthorn fruit, seed, and pulp oils in combination with honey, royal jelly, and other healthy ingredients to nourish the skin. It is supercharged with anti oxidants and anti inflammatory properties that aids in healing and restoration. It is known to combat dry skin, fade age spots and help prevent and treat wrinkles. The honey component is loaded with nutrients, anti-oxidants and healing compounds. It is paraben free, petroleum free, and not tested on animals. Available in Body Wash, Body Cream, Sugar Scrub, Eye Serum, Sunscreen,Deodoarant, Lip Balm and more! Those who have tried it are raving! 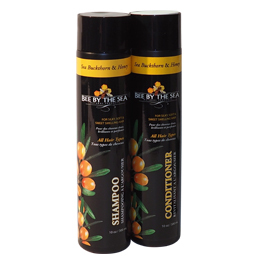 Lather in softness and shine with our rich blend of sea buckthorn fruit and seed oils, combined with honey. Sea buckthorn is loaded with antioxidant vitamins and essential fatty acids to nourish and revitalize your hair, while honey gives it strength and shine! Why in the world does a garden centre like Grobe's offer this? 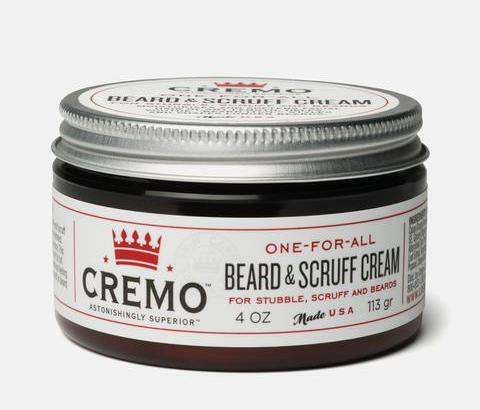 This exclusive line from the Cremo Company of California offers a grooming experience unlike any other. The Shave Cream does not lather, but a very small amount will coat the face or legs with a light cream that will allow 'back stroke, against the grain' shaving without grabbing. It will be the closest shave you will have ever experienced. It is super slippery and concentrated, and a single tube lasts for months! 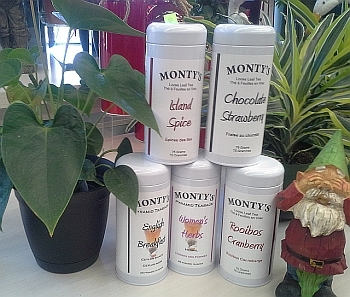 The Original Shave Cream has a scent of bitter orange, and is ideal for even the most sensitive of skins! The Cooling Shave Cream gives you a refreshing hint of menthol - but is not harsh. The Sandalwood Shave Cream offers a relaxing scent - and your 'other half' will love it. The Clearing Shave Cream is perfect for sensitive skin, plus it adds special ingredients to prevent bumps, blemishes and ingrown hairs. 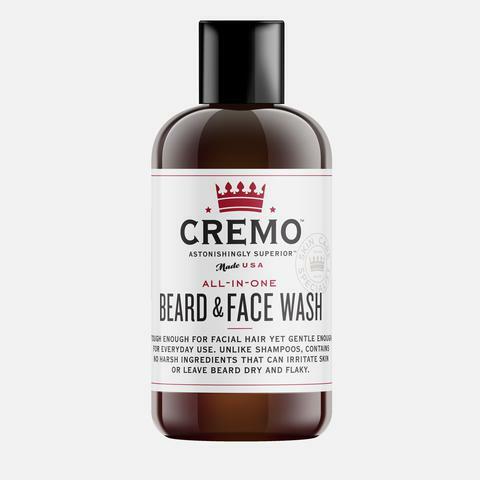 Cremo Face Wash cleans deeply and gently, rinses completely and has absolutely no scent. It's not a jarring 'scrub', but a face freshening cleanser. 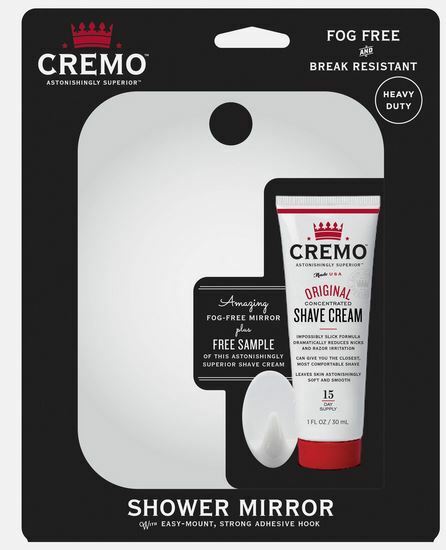 Cremo Face Moisturizer which will convert even the most 'un-moisturizer wearing' of men. It is non-greasy, readily absorbed, soothes the skin and also has absolutely no scent. You will see and feel a tremendous difference. 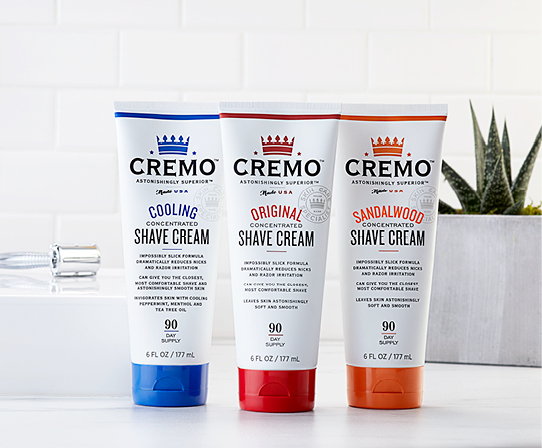 Cremo Post Shave Balms (available in menthol infused Cooling and Skin Clearing formulas) will make you smile with how good they make your face feel post shave. 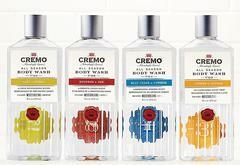 Cremo Body Wash was developed by top scent experts with a thoughtful blend of ingredients curated from around the world. Much more than just a one-trick scent, these formulas are layered and complex, so they evolve as you shower. You'll enjoy a strong, long-lasting scent that will complement, not overpower, your other fragrances. It is balanced for all seasons. In dry winter, you need more moisture to prevent flakey, itchy skin. In humid summer, you want something crisp, light and breathable. Cremo Body Wash is perfectly balanced and enriched with marula oil so you’ll feel thoroughly moisturized without that heavy waxy feeling -- perfect in any weather. Convert him to 'shaving in the shower' for an even better shaving experience. Hot steam and water softens the beard for an even closer shave.. and no messy sink to clean! Most "Fog Free" mirrors rely on a delicate coating that quickly wears off, leaving you with an almost useless mirror. They warn you not to use any cleaners and to avoid touching the surface. This mirror can be touched and cleaned any time you'd like. It is distortion-free and extra-thick to retain heat and keep the surface fog-free. Simply place the mirror under warm/hot shower water for a few seconds. The mirror will warm to that temperature, preventing the surface from fogging up. Highly recommended! Includes a two week sample tube of Cremo! 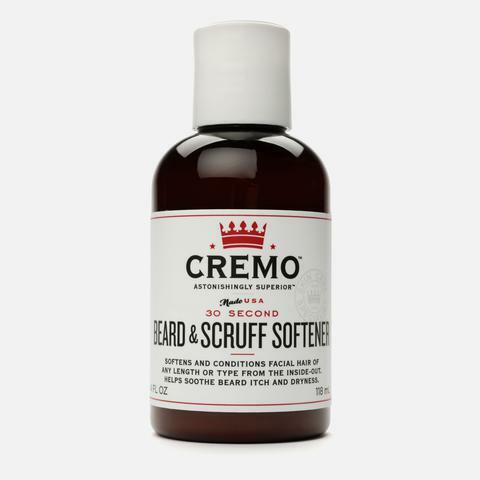 Since it's introduction less than a year ago, Cremo's new line of affordable beard care products have received rave user reviews - and now Grobe's has them! The hair on your head is not the same as the hair on your face, and it should be treated with products designed to keep it healthy. The Beard Wash contains no harsh irritants and is tough enough to clean and freshen facial hair and stubble yet gentle enough to use every day. It's lightly scented with natural essential oils for a supremely fresh and clean feel. The Beard & Scruff Softener takes but 30 seconds to work it's magic. It has powerful moisturizers and beard-specific conditioners that penetrate thick facial hair to soften from the inside-out, giving you and those close to you an astonishingly superior feel. The Beard & Scruff Cream is for longer beards that get unruly and require help to "lay down" for a more groomed appearance. This cream helps moisturize and soothe "beard itch"at every stage: from stubble and scruff to full beards. For longer beards, this lightweight formula is designed to style and shape without feeling heavy or greasy. The Beard Oil is lightweight and non-greasy way to reduce beard itch and keep your beard fresh and moisturized. Only a few drops are required. The ingenious Readerest magnetic clips really work. You will wonder why YOU didn't think of it. 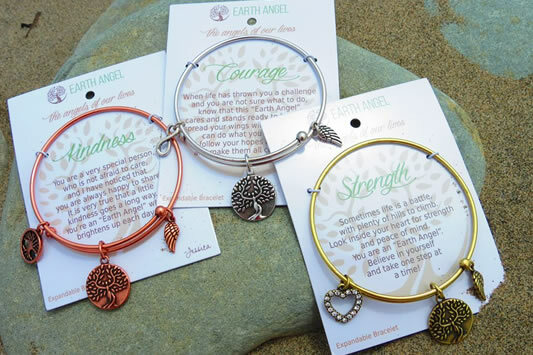 NOW IN STOCK AT GROBE'S! Perfect for suspending items up in the garage or shop. 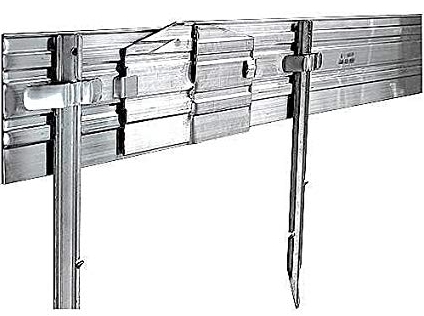 Transport goods safely without frustration at a jammed cam or strap. Secure that Christmas tree to the car in a jiffy. 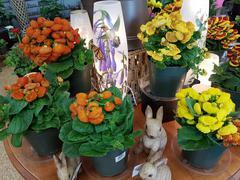 Raise/lower lighting fixtures over plants. 2 sizes - Largest will hold up to 275lbs! Compare online... the best price is here!